This main meal salad tastes great on a hot summer’s evening. It is filling, but not heavy and delicious with the fresh pineapple. Slice the tempeh in thin bite-sized pieces. Brown in a frying pan evenly on all sizes and season to taste. We used a Mesquite sort of flavoring. Prepare the pineapple and cut into bite sized pieces. Grate the carrots and cut the scallions. Cut the red bell pepper (discard the seeds and stem). In a bowl, whisk together mustard, oil, and juices. In another bowl, toss together cabbage, carrots, herbs, and scallions. 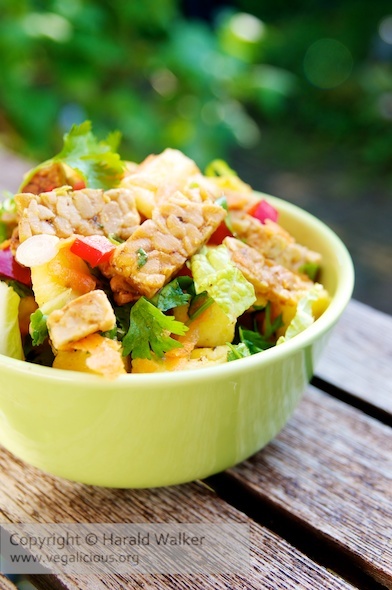 Add tempeh mixture to vegetables and toss. 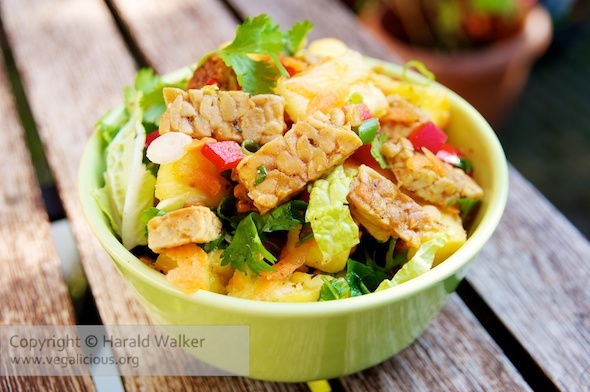 Posted by Chris Walker on July 4, 2011 in Bell Pepper, Cabbage, Carrot, Salads, Tempeh.